I am so accustomed to sleepless nights that I don’t even want to mention it – it is a new normal for me at this altitude. Breathing at low oxygen environment creates anxiety and I felt like if I went to sleep I will stop breathing which kept me awake all night. Kamlesh and I were so afraid we had the lights on all night. In addition to that, I started noticing tingling in my fingers during large part of the morning since last three days. It is one of the many side effects of Diamox and others in my group confirmed the same. Even after wearing a liner and a heavy-duty Thinsulated glove my fingers are numb. I had to adjust straps on my hiking poles so I can use them with thick gloves. I have doubled up my buff and changed to a new (i.e. my last clean pair) of base layer and socks. One last look at Lobuche. 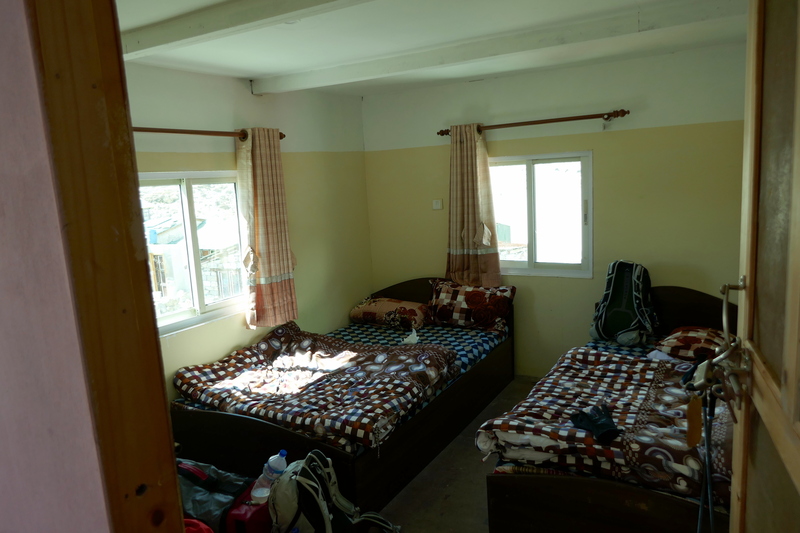 Today is a big day – first we will go to Gorakshep and check into our hotel and then, if everything is OK, to the Mount Everest Base Camp. And second, I will be celebrating my 50th birthday (based on lunar calendar) tonight. One of the main reasons why I am here! 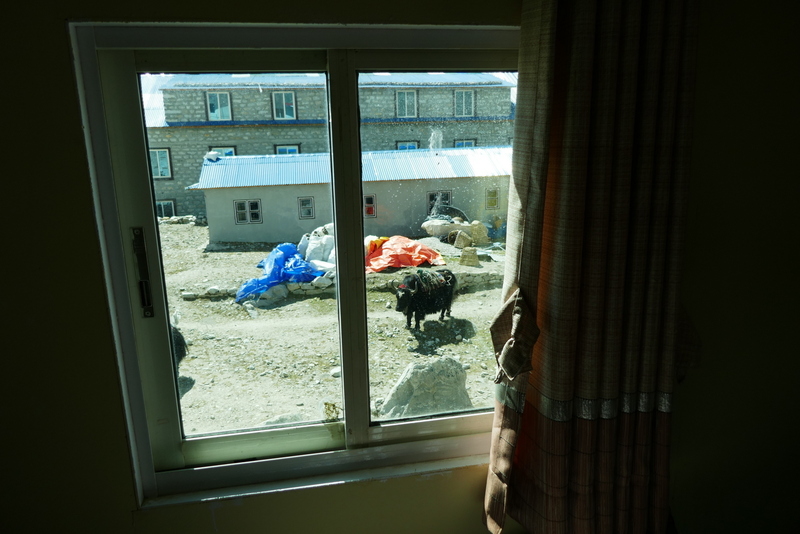 If everything works out the way we planned, today will be the longest day on our itinerary so I decided to split my write up into two parts, one for Lobuche to Gorakshep and the other for the Everest Base Camp trek from Gorakshep. The Brits are still hiking in a single file. 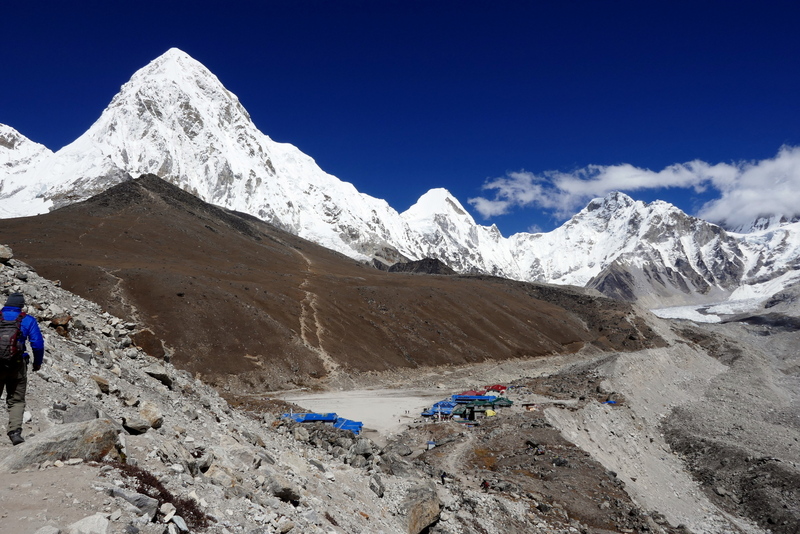 Gorakshep is the last (semi-permanent) human habitat before the Everest Base Camp. The “k” in Gorakshep is not pronounced so it’s called “Gorashap” (Nepali: गोराशप). This small and seasonal settlement is on a frozen lakebed covered with sand. 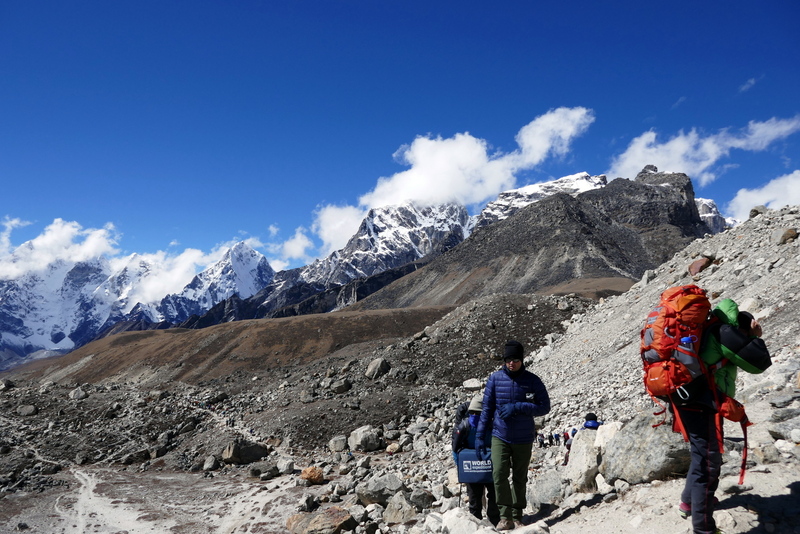 When you look at the numbers, the net elevation gain today is less than 200 m as we start our hike at 5000 m in Lobuche and end up at 5164 m in Gorakshep in about 5 km distance. The most important part to remember is that it’s at 5 km height! Every step at this elevation (due to low oxygen levels) is several times tougher compared to the same at the sea level. I had to take a couple of micro breaks while tying up my shoelaces this morning. During my training for the EBC trek, we spent a few days at Mammoth Lakes (~8000 ft) -the highest town in my home state California. While there, I learned that several competitive cyclist train there because of its high altitude which helps them build endurance and increase performance for the actual competition usually at a much lower altitude. It was noticeably more colder than yesterday. Today was the first day I hiked pretty much all the way in my down jacket and heavy-duty gloves and didn’t feel like taking them off. 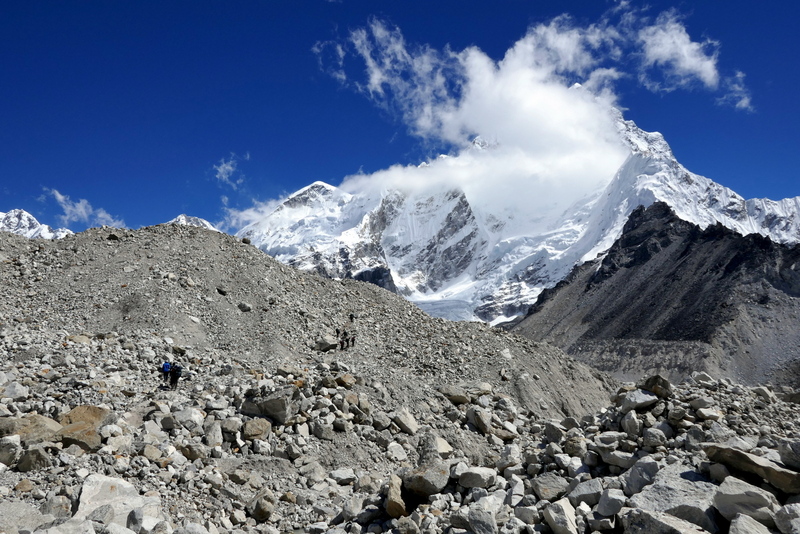 The trail from Lobuche goes along the Khumbu glacier not very steep but a gradual incline here and there. The distance is also not that much compared to what we have hiked in previous days but due to the elevation effect it seems very long and difficult. The glaciers in this part of the world looks different from what I have seen in Alaska. At first sight, they look like a dry river bed covered with dirt and scattered rocks. When you look closely, you see small puddles of water with a thick sheet of solid ice above it. Rush showed us a high altitude trekking technique – almost like a robotic motion where you plant one foot in very slow motion and then using both the legs lift your body for the next step, push and pull method. Despite hiking on a relatively flat trail, I found myself taking micro-breaks almost every 3 to 5 steps. After initial gradual incline, the trail goes down before the final incline leading to Gorakshep. Entire trail is dusty with scrambled rocks and boulders from years of landslide and glacial activities. 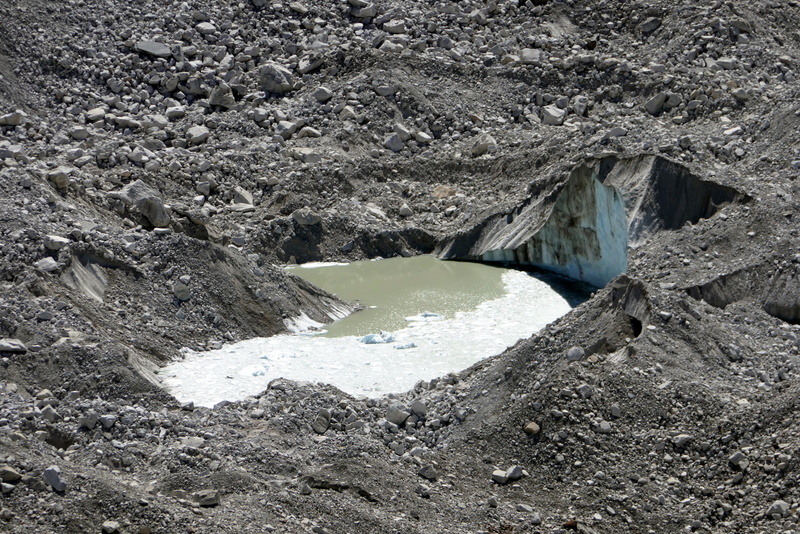 Just before Gorakshep you cross a large moraine of the glacier Changri on the way. On the way to Gorakshep. 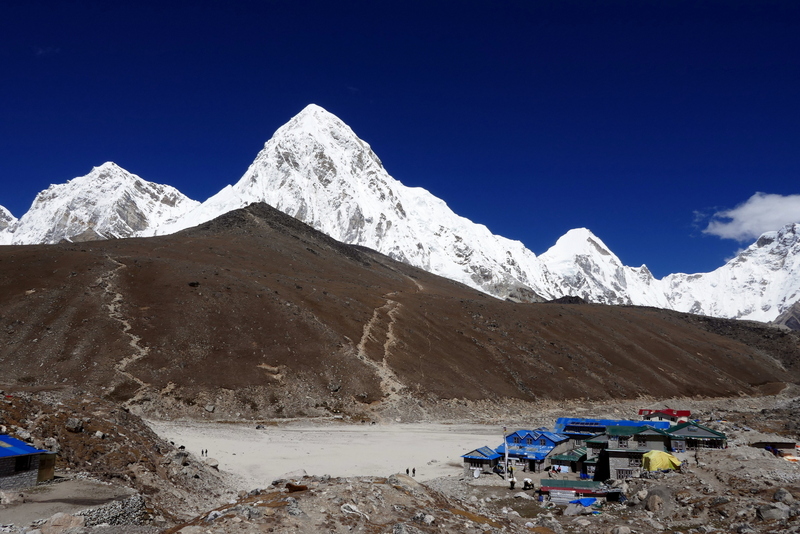 Ama Dablam was the prominent peak last few days which is now replaced by Pumori that is right above Gorakshep town from the trail view. Panoramic view of the trail just before Gorakshep. 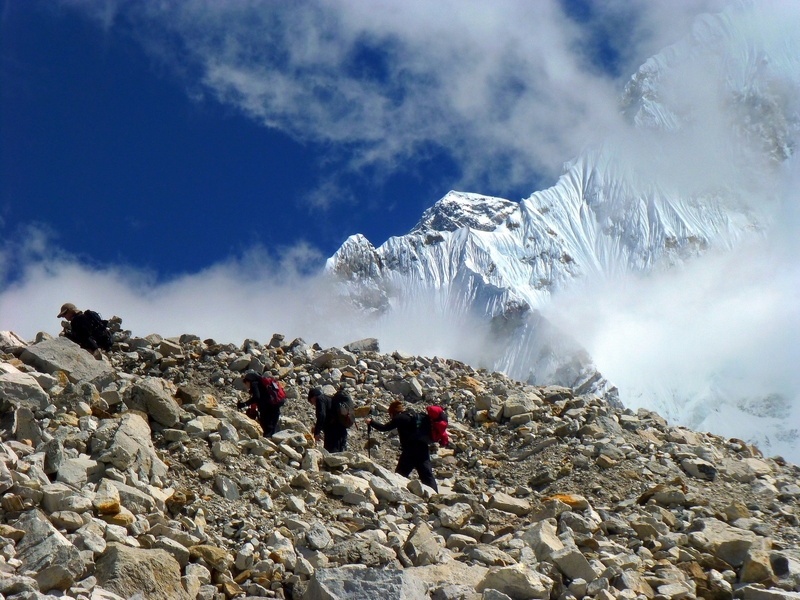 Pumori is rising above Kala Patthar. Click for a larger view. 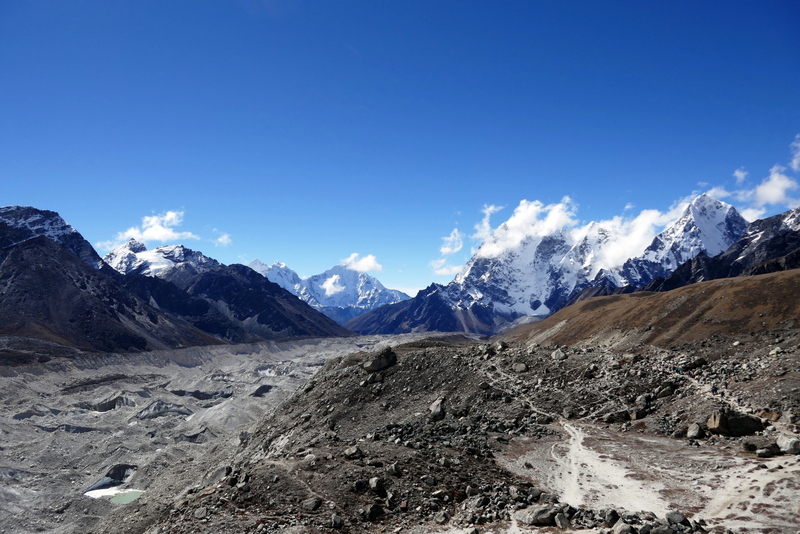 Nuptse and other mountains from the Everest range now dominate the right side of the trail. 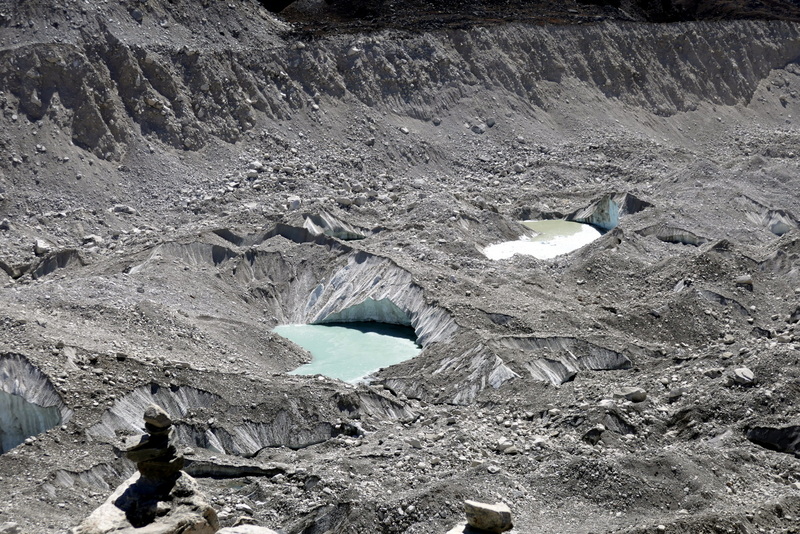 The trail is covered with moraine of Khumbu Glacier. Panoramic view from the trail towards Gorakshep. Click for a larger image. 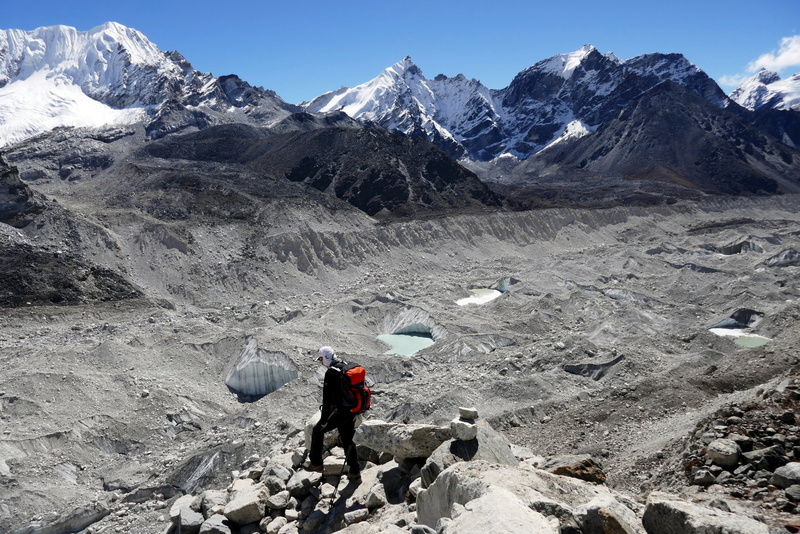 The last lag of the 3 hour trek, right before the Gorakshep, we cross a moraine of Khumbu Glacier. 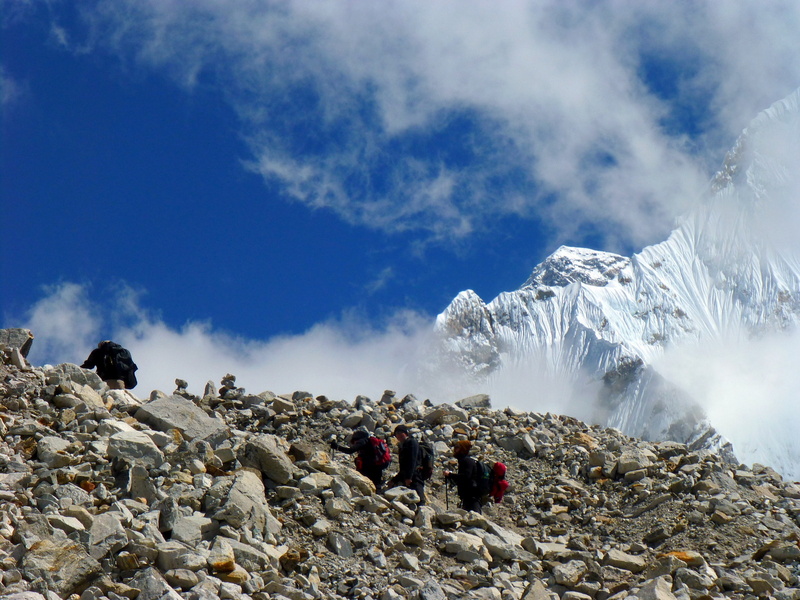 The trail leads to a ridge before the Gorakshep with Pumori dominating the sky. This part of the trail is very rocky and less defined. 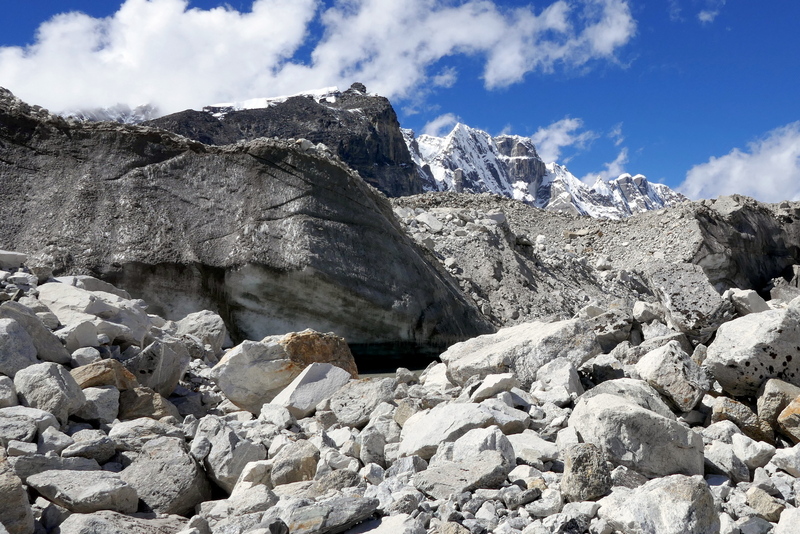 Rocky terrain along Khumbu Glacier. 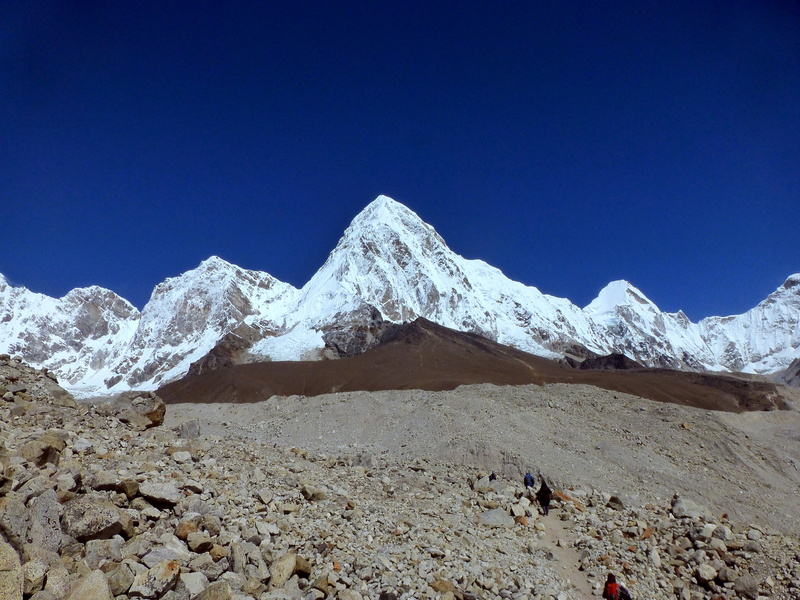 Pumori and Kala Patthar. 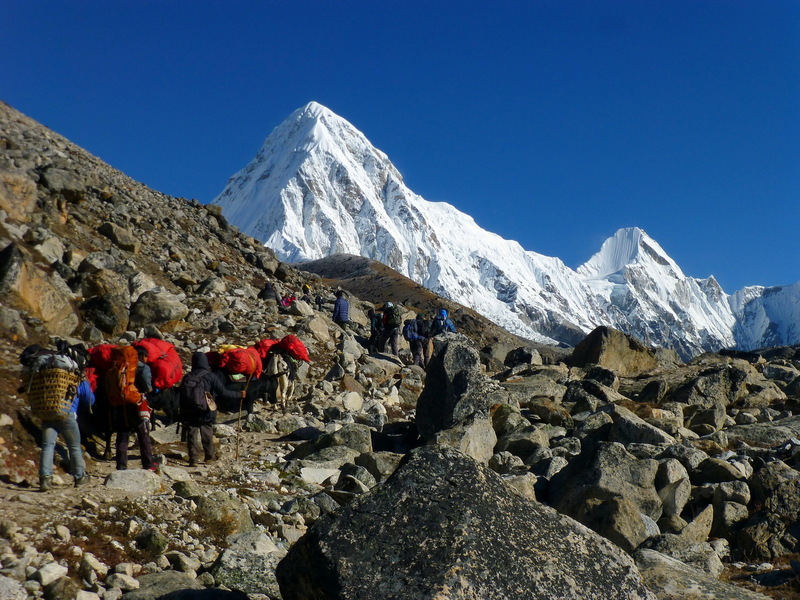 Gorakshep is tucked in a valley between the first ridge and Kala Patthar. After we climb the first ridge, we see Gorakshep – a small seasonal town on a frozen lakebed. 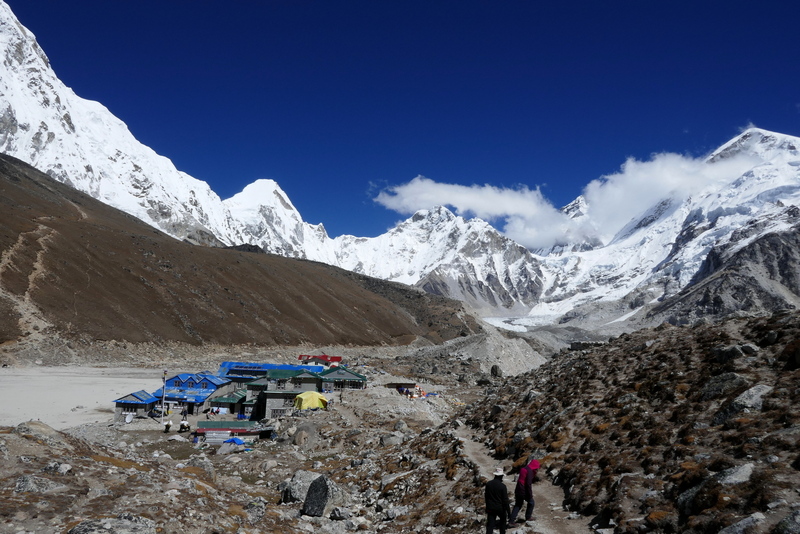 Gorakshep is the last stop before the Everest Base Camp. 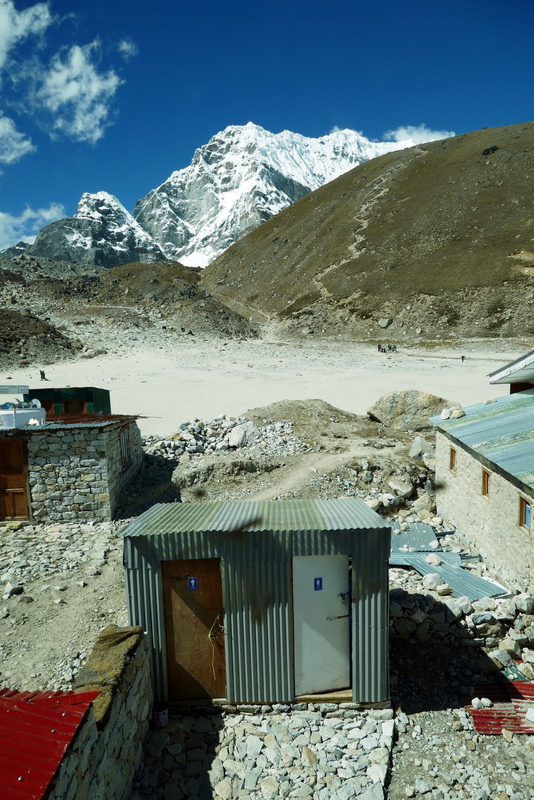 It used to be the old base camp several years ago but after the Khumbu Glacier receded, the current base camp moved further up. There is a small helipad on the ridge we crossed before entering Gorakshep. This is the entire Gorakshep settlement. Click for a larger view. Yeti Lodge courtyard. Our rooms were in the new building (right side). A porter enjoying warm sun on hotel patio. Hotel entrance. Two outdoor toilets on the right are used during the day time. Upstairs lobby. There were two toilets on the right side for night-time use. The hotel, Yeti Resort (or Lodge?) was much better than I expected at this elevation! We were upstairs in the newer building on the right side as you enter the hotel. The rooms and lobby were carpeted and reasonably insulated. There were two common toilets per floor to be used only during the night-time. During the day time, they asked us to use the one outside near entrance. We arrived around 11 am and checked into our rooms. Looking at the weather and our guide Deepak suggested we go to the base camp today and Kala Patthar tomorrow. We had a quick lunch and a brief rest break before heading to the Everest Base Camp!